Images from Medici Dossier. Source: Dr Christos Tsirogiannis. 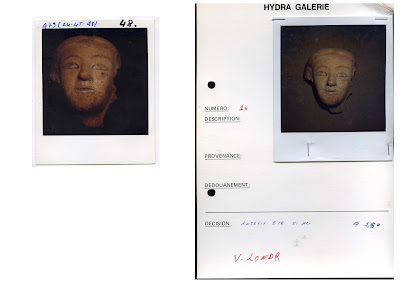 It is not clear why Bonham's has not mentioned Hydra Galerie in the collecting history. But note that on the card there is the annotation that the piece was to be assigned "v[ia] Londr[a]" with a value of $1,500. David W. J. Gill. “Museum Supplement: Recent Acquisitions by the Fitzwilliam Museum, Cambridge, 1971-1989.” The Journal of Hellenic Studies 110 (1990), pp. 290–294. www.jstor.org/stable/631820. I note that among the three examples I described was one that was acquired from N. Koutoulakis. This new identification yet again raises issues about the due diligence process conducted by and on behalf of the auction houses. Staff at Bonhams are, I am sure, aware that the Cultural Property (Armed Conflicts) Bill is passing through the UK Parliament at the moment and that it is in the interest of those involved with the sale of archaeological material to be seen to be taking action when concerns are raised about objects that surface on the market. I understand that the relevant authorities in Italy and the UK have been informed. For further discussion of the antefix see ARCA.